Spooky Witch Fingers are a perfect Halloween party treat! Sometimes I like to surprise my kids with a fun after-school snack, so recently I made these Spooky Witch Fingers. They are incredibly easy to make and the kids thought they were really cool. You only need a few ingredients and in a short time, you can make your own Spooky Witch Fingers. 1. Open the bag of Green Candy Melts and melt over a low-medium heat on the stove. Pour melted candy melts into a tall glass. 2. Open the bag of pretzel rods and dip each pretzel rod into the melted green candy melts. Let the excess drip off into the cup and then place the pretzel rod onto a cookie sheet lined with wax paper. Allow the pretzels a minute or two to dry and then move the pretzels to a second cookie sheet lined with wax paper. This insures that your pretzel won’t dry in a puddle of candy melts. 3. While the candy melts are still wet, place one sliced almond onto the top of each pretzel rod. Push the sliced almond into the candy melts a bit to create a cuticle. 4. While the candy melts are still slightly wet, take a toothpick and draw lines onto the witches fingers to create knuckles. Add green sprinkles while the candy melts are still wet to create warts if desired. 5. Once the candy melts have dried, paint black food dye onto the sliced almonds. Be sure to allow the food dye to dry before serving. Spooky Witch Fingers are perfect for an after-school snack or as a fun Halloween party treat. People love the sweet and salty combination and they are always a hit because of the way they look. Another great use of candy melts to make a great DIY edible project. You have to be the best mom to have a snack for every occasion and this Halloween pretzel rod is very cool. What a great idea! I’ve seen similar things like this, but not where pretzels were used. And I would’ve been the one to let them dry in a puddle of candy melts…so thanks for the step by step instructions. These are super cute! Wow, that is such an amazing snack! I cannot believe how realistically creepy they look! My gosh that is so cool! I am going to do that. I never even thought about doing something like that and it’s easy to do. What a fun idea. These are so cute! So cute and creepy. Perfect for a Halloween party. And a great seasonal activity to do with the kids. These are so creeptastic! I love them! These witch fingers would be a huge hit at our party this year. The kids will flip! What a clever idea! The fingernails are so creepy and gross … perfect for Halloween! Am I the only one seriously grossed out at the thought of eating fingernails? I would never make it on a reality show! They do look fun to make though, and I bet kids love them. I’ve never seen these before and just love them! What a cool and unique idea! You did an amazing job on these! I’ve seen these done many many times, however, the ones I’ve seen aren’t nearly as detailed as yours are! Aren’t these a lot of fun? I think they would look great on a Halloween party table! Delicious too. Wow, that is such an amazing snack! I can’t wait to make them for my son’s friends! I will have 12 boys coming over for Halloween! What a super cute DIY Halloween idea! These look super creepy, but yummy for kiddos. Those look so realistic! You did an amazing job on the art part of it! Definitely need to try these! These look so great. Creepy but also a tempting snack. Halloween makes for such fun treats. This is so fun! And I love how easy this is to make! Such a cool and spooky Halloween treat! Love these, and they look so easy to make. Spooky yet adorable and so easy to do! When it comes to Halloween food, I like both – easy and a tad spooky. Love these!! I SO love that you painted the nails black too! How creative is this Halloween treat! It’s really simple but it’s pretty creepy!!! The kids will love it. Haha, these are gross – we would love to make them! Love the addition of the warts.. you did a great job making these look realistic. What a fun Halloween treat. I love these! My kids would love them and I like that they are easy to make. What a fun way to decorate pretzels. It is kind of yuck and cool all at the sometime. Might have to paint the fingernails different colors. these are sooo freakin cool! I’m making this for our Halloween work function! OMG, I love the warts! This look so fun and actually pretty tasty. I think you did a fantastic job on these delights! This is such a fun snack and simple to make. I’ve made them before but didn’t think to include the little warts, yours look great! Ooh, this looks so awesome! I’m gathering a few halloween treat ideas and I’ll definitely consider making this. Wow! I’ve seen the witch fingers with pretzels before but never with the little lines for knuckles. That truly makes them! These will be great for our Halloween party. Thank you. Oh my goodness what an amazing idea! They really do look crazily creepy but oh so edible. Oh my goodness! How spooky an creepy are these! Not only that, they are super easy to make. My kids would love to make these for a special Halloween treat! These are so wonderfully creepy! You did such a good job with them. These are so much fun. They would look great at any Halloween party or to give out to trick-or-treaters. There really are so many fun things you can do with pretzel sticks. This would be perfect for a spooky halloween party! I really love this idea. It looks so fun to make and I bet it’s yummy too. I know my kids are going to like it. These are so much fun! I love the idea of making these for a Halloween party. Amazing recipe this is! I know my kids would love this treat. This is so perfect for the Halloween season. These are AWESOME. I need to make these for my Justin’s class treat. He will love them and I’m sure the little kinders will too! So cool. That nail is super creepy. And it’s also the perfect touch. Wow, these really look like witch’s fingers! I think all the kids would love these if I gave them out to trick or treaters on Halloween night. These are so detailed! Never thought about using toothpicks like this to add detail while the chocolate is still hardening. These are such a fun treat for Halloween. 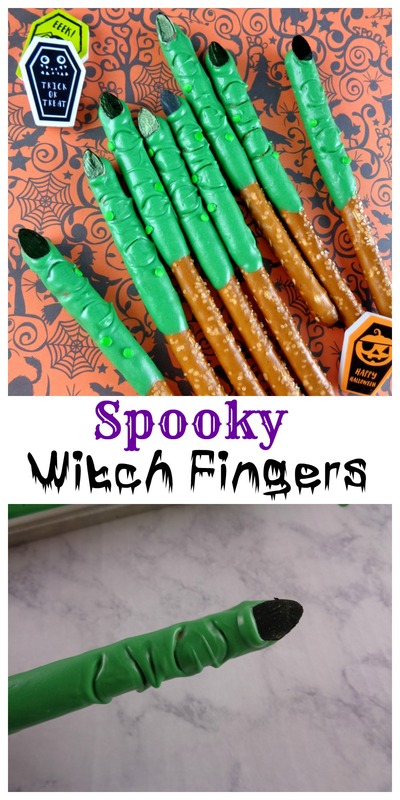 We are having a Halloween party this year and these spooky witch fingers are sure to be a big hit. I will have to give the recipe a try on the weekend. These look AWESOME! What a creative and fun idea. Super festive and I’m sure they’re really tasty. These would be perfect to bring to a Halloween party. These look so fun to make. And they actually look kind of creepy! I will have to try this out before Halloween! This is another great Halloween treat! I think they would be a hit with kiddos and adults both. So much fun for such little effort! I love easy holiday treats like this! Too cute! I know that my oldest son would get a kick out of these witch fingers, so I may have to try this. These are so cool! I just showed this post to my friend’s 5-year-old son and he was saying “Whoaaaaa, I want these!” So his parents are probably angry at me now lol and I’ll likely help him make them. Love the recipe. These are so perfect for a fun snack or Halloween party! They would be awesome in a clear glove and popcorn center to hand out as party take homes! These are too cool! They look so fun abc realistic! And if they taste yummy too then you’re onto a winner. Those almonds work really well as a nail. I love these! They are so cute. I made pizza witch fingers a few years back and kids loved them. Your Guide to the 2017 Jack O’Lantern Spectacular at Roger Williams Park Zoo Bertucci’s is Bringing Kids Eat Free Wednesdays Back!